I’ve realized over the last few years that I’m not a good spectator. As a matter of fact I’m a pretty poor one. It’s not that I yell obscenities at the referees, second guess the coaches or have unrealistic expectations for the players. No, it’s simply that I find it hard to just sit and watch a game. Even the “biggest game of the year” – the Super Bowl, a game I was looking forward to seeing, was hard for me to just sit and watch. I ended up sending text messages throughout the game to my friend and great Packer fan Jack McQueeney just to keep me interested. And it doesn’t matter if it’s my favorite team or my kid’s team playing I just can’t sit and watch. Now this poor spectatorship is acceptable in most cases except when it comes to watching my own kids play. So a number of years ago I committed to no longer being just a spectator of my kid’s sports but instead being a participant in some form or fashion. So I help coach my kids every chance I get. I’ve coached middle school, JV and varsity basketball, varsity baseball and scores of recreational teams. Coaching keeps me in the game. 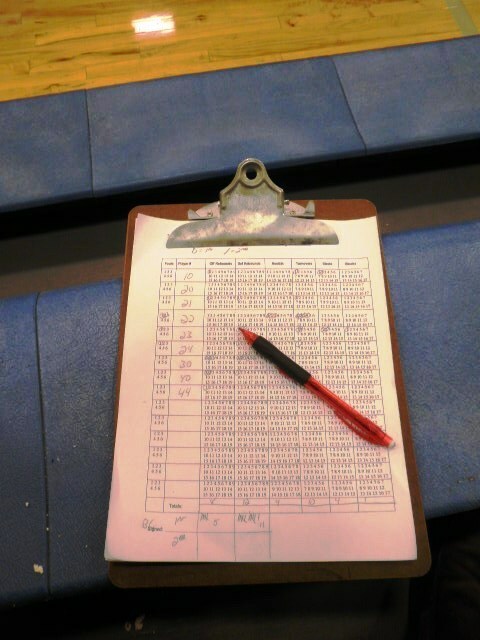 I’ve also kept “the book” or stats for teams I’m not involved with as a coach. This winter our son Mitch is playing on our school’s JV basketball team. So I’ve become one of the statisticians for both our JV and varsity teams. It gives me involvement during the games by doing something beneficial for the team and the coaches. For sure I’m motivated to be involved by my love for kids, especially my own. But I’m also involved because I want (and need?) to belong to a team more than I need the association that comes from just being a fan. But there is another factor that drives me to being more than just a spectator. It’s simply that I want to make the biggest difference I can, not just in my kid’s sports, but in every aspect of my life. So no matter where God has placed me being a spectator just doesn’t cut it. I’ve been blessed with so much and so am accountable to do more than just sit in the stands and be a spectator.